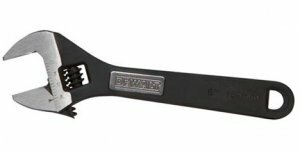 We briefly mentioned DeWALT's new adjustable wrenches when we covered the announcement that DeWALT would now be making hand tools, but we didn't have any information other then the price range of $10.99 to $34.99. Today DeWALT let the rest of the cat out of the bag and gave us a full press release. The wrenches will be available in five sizes (6", 8", 10", 12", 15") and features a black DeWALT Tough Coat™ magnesium phosphate finish that is said to help prevent chipping and also provides a no-slip surface. The wrenches also feature an increased neck size and enlarged teeth and worm gear that all give the wrenches improved strength. "Professionals turn to DeWALT power tools and accessories because they know our products won't let them down. As a result, contractors experience absolute confidence, knowing DeWALT has their back," said Chris Alagno, global product manager – wrenches, pliers, snips. "Our new hand tools, including these adjustable wrenches, are professional workhorse solutions that measure up to tough standards and deliver durability, strength and quality performance."